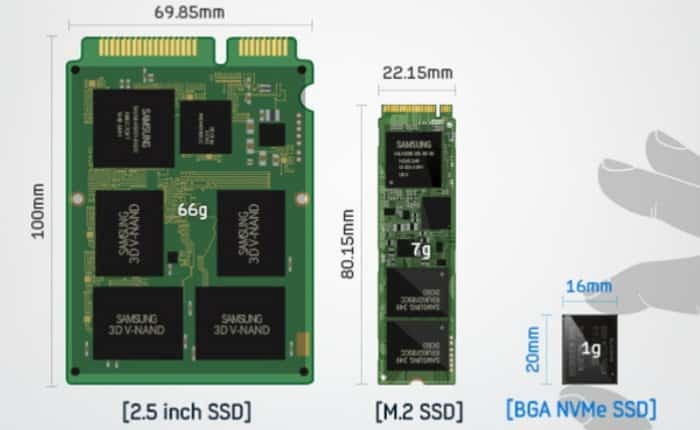 South Korean tech giant Samsung, has started mass producing an NVMe PCIe SSD which can hold up to 512GB of data in spite of being smaller than an average US postage stamp! The itty bitty new storage device is designed to be a single Ball Grid Array package meant for high-end PCs (like Apple’s Mac products), ultra-thin laptops, and perhaps tablets too. Tipping the scales at just 1 gram, the Samsung BGA NVMe SSD measures a mere 20 x 16 x 1.5 millimeters in size. Its modest volume allows it to boast about taking only about one hundredth the space of a traditional 2.5-inch HDD or SSD. It wraps in all the essentials such as NAND flash memory, DRAM and controller, of course. Labelled PM971-NVMe, the NVMe SSD lineup will be offered to OEMs in 256GB and 128GB memory capacities too. Samsung claims the hardware is capable of achieving 1500MBps read speeds and 900MBps write speeds, thanks to its homegrown TurboWrite technology. The latter temporarily utilizes select portions of the SSD as a write buffer. To put the capabilities of this drive more simply, users would be able to transfer a 5GB 1080p high definition movie in roughly 3 seconds, or download it in approximately 6 seconds. The highlight of this new NVMe SSD is its tiny body. As PCs and tablets continue to shrink in size, the need for smaller yet fiercely competent hardware solutions keeps intensifying. It’s not just about reducing the bulk. An SSD as diminutive as the Samsung PM971-NVMe will also be able to offer relatively more flexibility in component placement and overall design to device developers. What’s there not to like about it? Samsung intends to start shipping out its NVMe SSD series to manufacturers worldwide starting from June.